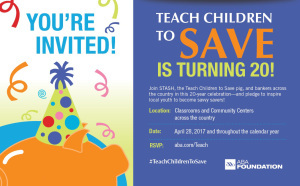 The 2018 Teach Children to Save Day is exactly onemonth away and will be celebrating its 20th birthday! Teach Children to Save Day is a free national program sponsored by the ABA Foundation, and was started in 1977 to coordinate bank volunteers in helping young people develop a savings habit early in life. On Friday, April 28, 2018, bankers will be teaching young individuals about the value of saving and encouraging them to start young in order to save more. Bankers will be volunteering in classrooms, at after-school programs, at youth centers and in many more locations. How can you get involved with the Teach Children to Save Day you ask? Simply register for free at the ABA website. Once registered, you will have access to free presentation planning tools, lesson plans, social media guides and much more. To learn more about Teach Children to Save, click here. Categories: Teachable Moments, Try This!